The downtown Riverview Plaza Hotel is undergoing a $60 million renovation to become a four-star Renaissance brand hotel. 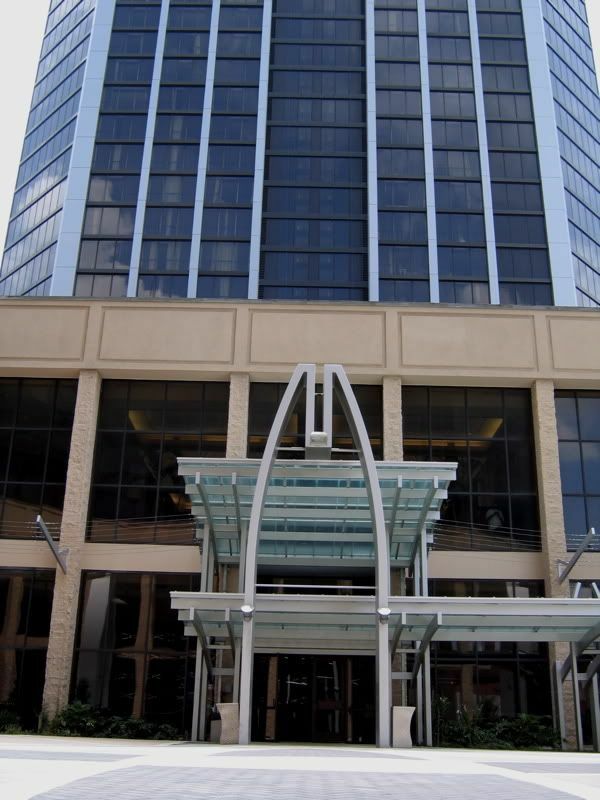 The 375-room downtown hotel is owned by an affiliate of the Retirement Systems of Alabama, and will be a sister hotel to the Battle House Hotel located down the street. Part of the renovation includes adding a crown to match the RSA Battle House Tower and redesigning the plaza entrance on Royal Street. Does anyone know the details of the plaza redesign? I think I like it. I'm not sure yet. If the color scheme works out like the renderings, i think i'm ok with it. But, if not, I think it's gonna look too much like the RSA Tower. 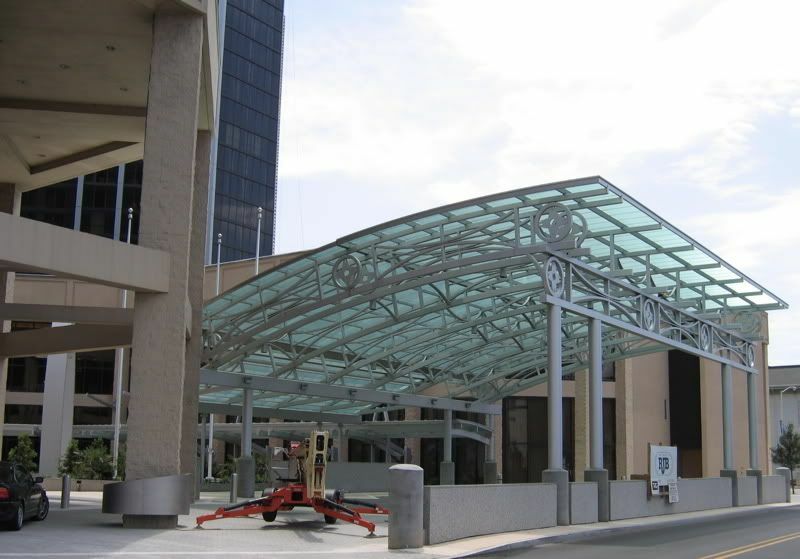 The Riverview Plaza Hotel main entrance will move from Water Street to Royal Street. The cramped Water Street carport has a small driveway, making it difficult to load and unload buses or large numbers of cars at the same time. The new entrance will have three large lanes under a glass-and-metal canopy, with a covered walkway to the new front door. The old entrance will be retained and used during Mardi Gras when the Royal Street entrance is blocked for parades. Inspired by Mobile's maritime industry and the hotel's location near the waterfront, the new look of the Riverview Plaza Hotel is based on a nautical theme. The renovated hotel will have a bold primary color scheme of gold, red and blue. Each floor of the hotel will be referred to as a "deck". First-floor meeting rooms are named for types of boats, second-floor meeting rooms are named for local waterways and the fourth-floor meeting rooms are named for naval ranks. Light food and drinks will be available in the lobby, and an internet cafe will be adjacent to the bar. A second-floor seafood restaurant with bar and buffet will open by late summer. Niiiiiiiiiiiiiice. I like the last picture. Last time I was down there, they were still cutting the pavement for that HUGE awning in the first photo. 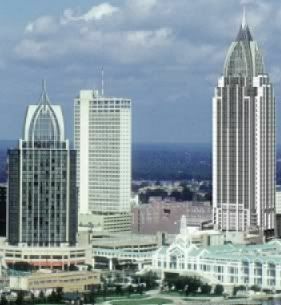 I think Mobile's gonna have one of the best skylines along the coast once this gets finished. Then the area's really gonna take off. 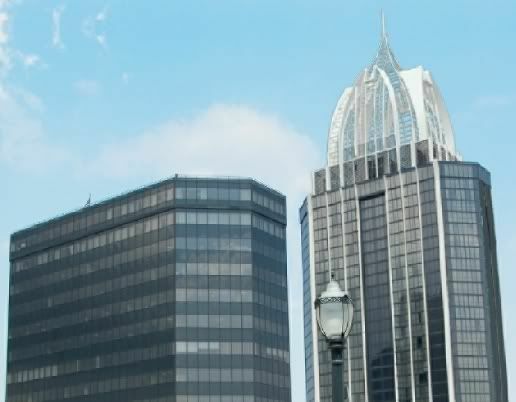 According to Ron Blount, RSA project director, the Riverview Plaza Hotel renovation should be finished in late November, and a 125-foot spire will be installed on top of the roof by the end of the year. FOX10 News ran a story about the christening of the Rennaisance Riverview Plaza Hotel this week. 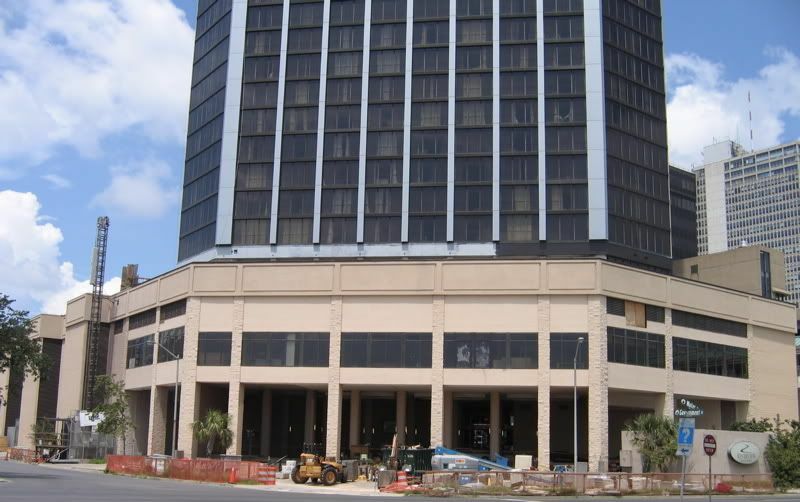 The interior renovations are complete, and the hotel will be capped with a 100 foot tall crown within a few weeks. Just saw on the news,nbc15. That it will be 434ft! The OLD Amsouth building at 424 better tighten up! I hope the owner Toomey quits worrying about catching tarpon and put some money in that old building. Put a 50ft A frame roof would be a great addition , making it taller than anything in B-HAM. And o yeah................GEAUX TIGERS ! I hope we spend our time and energy on creating a better urban Mobile than who has the tallest building. I agree about making Mobile more urban. I don't think that toomey owns that building. his company is just the property manager. the owner is in New York City i believe. They just upgraded their elevators last spring. But yeah...more needs to be done to save it. According to Emporis.com, the height of the Riverview Plaza is 277'. Adding a 100' + functionless crown just asserts the building's place as the city's third tallest. I'd prefer to see money invested in dense, high quality infill development throughout Downtown, instead of monstrous architectural add-ons. Wait a minute, they're making a 277' building 434' ? don t shoot the rat. Also check out skyscraperpage.They say it is 374 now. http://skyscraperpage.com/diagrams/? welcome bamasport! U think like me. The condo on the courthouse land would fill in the gap within the skyline. If u look at the layout of downtown there is a void area between the city/county courthouse and the area around the riverview and the rsa complex. I wish also the Radisson would come out with the drawings. 210 ROOMS is what i heard on a small lot to build . Im guessing at least 12stories. I was just smiles when i heard about the condos on water street! Then someone posted the developer was going to put a office tower (400ft) in downtown also. In todays metro section of the paper; The crown is 150ft. Who neauxs? The 150 ft. figure seems to be mentioned most of the time, so maybe that's it. I just hope the new crown is being built to withstand hurricane-force winds. Where are people getting the 374' number from? on the skyscraperpage.com it says that the building is 114 m. which is 374 feet and with the new crown being 125 feet the building will be 499 feet but 500 sounds better . The hotel will be thesecond tallest building in the city and state.